The motor-yacht OH QUE LUNA is an Italian-built Admiral. She is elegant and fast, well maintained and constantly upgraded. 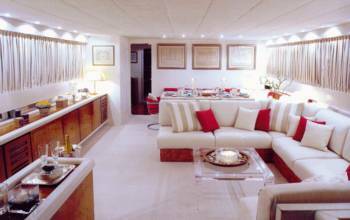 Her large saloon also houses a dining area. Meals can be enjoyed in equal comfort, al fresco, or on the shaded aft deck. OH QUE LUNA combines colours and materials in a relaxing and inviting way. You can be assured of the very best attention from a professional crew of five. 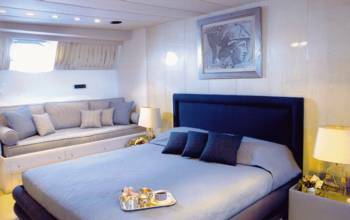 ACCOMMODATION : For eight guests in four cabins on the lower deck. 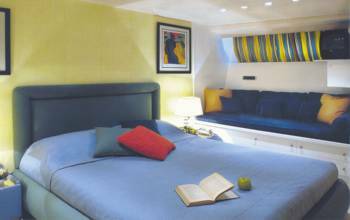 Two large double cabins amidships. Two twin cabins forward. All with en suite facilities with shower rooms.